Although the use of artificial fertilizer has supported increasing food production to meet the needs of a growing population, increases in nutrient loadings from agricultural and, to a lesser extent, urban sources have resulted in nutrient concentrations in many streams and parts of aquifers that exceed standards for protection of human health and (or) aquatic life, often by large margins. Do NAWQA findings substantiate national concerns for aquatic and human health? National Water-Quality Assessment (NAWQA) findings indicate that nutrient concentrations in streams and groundwater in basins with significant agricultural or urban development are substantially greater than naturally occurring or “background” levels. For example, median concentrations of total nitrogen and phosphorus in agricultural streams are about 6 times greater than background levels. Findings also indicate that concentrations in streams routinely were 2 to 10 times greater than regional nutrient criteria recommended by the U.S. Environmental Protection Agency (USEPA) to protect aquatic life. Such large differences in magnitude suggest that significant reductions in sources of nutrients, as well as greater use of land management strategies to reduce the transport of nutrients to streams, are needed to meet recommended criteria for streams draining areas with significant agricultural and urban development. 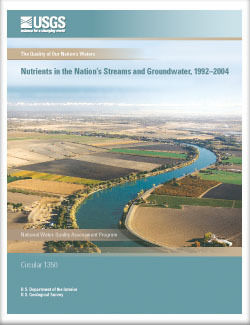 Nitrate concentrations above the Federal drinking-water standard—or Maximum Contaminant Level (MCL)—of 10 milligrams per liter (mg/L, as nitrogen) are relatively uncommon in samples from streams used for drinking water or from relatively deep aquifers; the MCL is exceeded, however, in more than 20 percent of shallow (less than 100 feet below the water table) domestic wells in agricultural areas. This finding raises concerns for human health in rural agricultural areas where shallow groundwater is used for domestic supply and may warn of future contamination of deeper groundwater pumped from public‑supply wells. Are levels of nutrients in water increasing or decreasing? A decadal assessment of trends in concentrations of nitrogen and phosphorus from about 1993 to 2003 shows minimal changes in those concentrations in the majority of studied streams across the Nation, and more upward than downward trends in concentrations at sites with changes. These findings underscore the need for reductions in nutrient inputs or management strategies that would reduce transport of nutrients to streams. Upward trends were evident among all land uses, including those only minimally affected by agricultural and (or) urban development, which suggests that additional protection of some of our Nation’s most pristine streams warrants consideration. The median of nitrate concentrations in groundwater from 495 wells also increased significantly from 3.2 to 3.4 mg/L (6 percent) during about the same period, and the proportion of wells with concentrations of nitrate greater than the MCL increased from 16 to 21 percent. Nitrate concentrations in water in deep aquifers are likely to increase during the next decade as shallow groundwater with elevated concentrations moves downward. The potential for future contamination of the deep aquifers requires attention because these aquifers commonly are used for public water supply, and because restoration of groundwater is costly and difficult. Long-term and consistent monitoring of nutrients, improved accounting of nutrient sources, and improved tracking and modeling of climatic and landscape changes will be essential for distinguishing trends in nutrient concentrations, understanding the causes of those trends, and accurately tracking the effectiveness of strategies implemented to manage nutrients.